On Remembrance Sunday members of the Green Party in Tameside attended the Service of Remembrance at the War Memorial in Stalybridge as a mark of respect and grief for everyone harmed by war. They wore white poppies as a symbol of their commitment to work for a world where conflicts will be resolved without violence and with justice. White Poppies for Peace made their first appearance on Armistice Day 1933 amidst concerns that the Great War 1914-1918, thought at the time to be the war to end all wars, would be followed by an even worse conflict. This proved to be the case when what is now known as the First World War was followed by the Second World War 1939-1945. 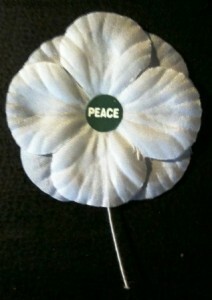 Hundreds of wars throughout the world later, and the killing of more than 200 million people, the white poppy continues to be a reminder of our failure to prevent war and settle conflicts without resorting to killing. This entry was posted in Activities, Tameside Green Party and tagged peace poppies, remembrance sunday, White poppies for peace by tamesidegreens. Bookmark the permalink.